LAS VEGAS— Taiwanese networking company EnGenius, looking to get into a hotly contested US market for home and small-business networking products, has announced a large lineup of competitively priced Wi-Fi and powerline products, along with separate business and consumer cloud services to manage them. EnGenius's announcements at the International CES included three Wireless AC Home Entertainment and Media Pods (basically, dual band 802.11ac routers with gigabit Ethernet and USB ports); an 802.11ac media bridge/access point with four gigabit Ethernet ports; and selectable dual-band 802.11ac USB adapters. 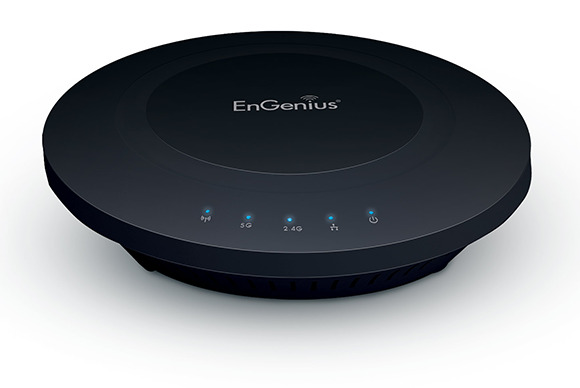 Additionally, EnGenius also announced new 802.11n routers and powerline adapters. The company is calling its new routers and the media bridge pods because they look a bit like diminutive flying saucers. The Wireless AC products are based on the draft 802.11ac Wi-Fi standard, the fastest version of Wi-Fi to date. However, speeds vary widely depending on antenna configuration, and the maximum speeds are only attainable on the 5GHz band (dual band 802.11ac routers operate in 802.11n mode on the 2.4GHz band). EnGenius will offer three models, which it plans to ship by spring. The $200 ESR1750C tops out at 1299mbps on the 5GHz band and 450 on the 2.4GHz band, the $170 ESR1200C runs at up to 866mbps and 300mbps, and the $120 ESR 750C maxes out at 433mbps and 300mbps. The media pod (ERB1300), which can function as either a bridge or an access point, will support speeds of up to 1299mbps and 300mbps on its 5GHz and 2.4GHz bands, respectively. It too is slated to ship by spring with a price tag of $180. The USB adapters, while dual band, are selectable, meaning you must choose which band you want to use them on. The EUB1200AC will support speeds of up to 866mbps on the 5GHz band or 300 mbps on the 2.4GHz band, and will cost $90. The EUB600AC will go for $70 and support speeds of up to 433mbps on 5GHz and 150 mbps on 2.4GHz. EnGenius says both will ship by late March. The new 802.11n Xtra Range Wireless Work & Play Routers are also available in several configurations, ranging from the top-performing ESR900 (max speeds of 450 mbps on both of its dual bands) and the midrange ESR600 (300 mbps per band) to the ESR350, a single band router with top speed of 300 mbps. They’ll range in price from $120 for the ESR900 to $100 for the ESR600 and $60 for the ESR350. The company also expects to ship these products by spring. The powerline products are Homeplug AV-compatible but support faster speeds (up to 500mbps). The new line consists of the EPL500, a basic adapter with one 10/100 Ethernet port; the EPL550G, which has one gigabit Ethernet port; the EPA3520, which in addition to a single 10/100 Ethernet port also functions as an 802.11n Wi-Fi access point; and the ETA3005, a bridge with five gigabit Ethernet ports and a 802.11n access point. The 802.11n access points support only 2.4GHz operations. The powerline devices are also due by spring. 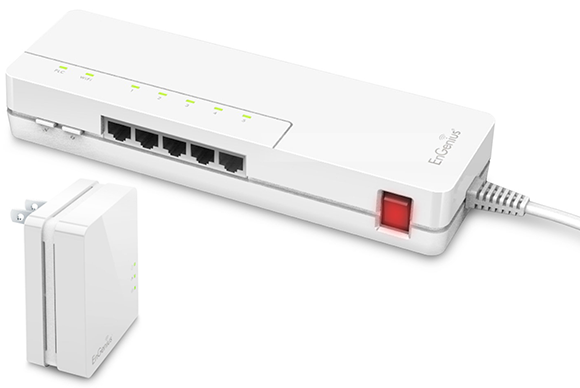 EnGenius will see them in kits (because you need one adapter to set up the powerline network on an existing router, and a second to connect a device to the network). The cheapest kit will consist of two EPL500 adapters for $80; the priciest will include an EPL550 adapter and the ETA3005 media bridge for $140. Also by spring, EnGenius plans to offer cloud services to support its consumer and business product lines. The service for businesses will let you monitor and manage not only access points, but a planned line of managed switches to be announced shortly, while the consumer cloud service will let you play media files stored on devices connected to a Media Pod router. EnGenius says it will afford access to cloud services via either desktop browsers or mobile apps.